Tiffany's Online Finds and Deals: Anti Fatigue Mat ONLY $3.80 for Amazon Prime Members! 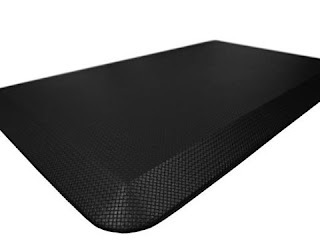 Anti Fatigue Mat ONLY $3.80 for Amazon Prime Members! If your an Amazon Prime Member you can grab this Anti Fatigue Mat for ONLY $3.80 !!! Anti Fatigue Mats are great for in the kitchen, work shops, ect. I love mine! Anti Fatigue Mats make washing dishes or cooking way more comfortable! This mat is 20x32x3/4 in and comes in black for this promo. This kitchen floor mat will drastically reduce the pressure on your feet, knees, and lower back by up to 32%. That means your feet will feel like you've lost 60lbs! ;-) Or instead of standing for an 8 hour day, it will be like you stopped working at lunch and were relaxing pool side all afternoon. The Sky Solutions antifatigue mat has a beautiful modern style to compliment your kitchen. . This is a safe standing mat great for behind a counter at a coffee shop, or any other high traffic areas. Our Anti-fatigue mats are ideal as a standing desk mats and provide comfort for people working at a stand up desk all day or spending long hours on their feet. More than stable enough to work as a fatigue mat in your garage. Most importantly we've designed the Sky Mats especially for the way you use it in real life. Stable and supportive so you can stand on the floor mat comfortably for long periods of time without rocking or compressing to the hard floor. Never worry about slipping or tripping face first into the counter again with our seamless low angle beveled edge and ultra-grip. CAN ONLY GET FROM ONE LINK Can NOT get if you got already anywhere.